Shopify is a cloud-based e-commerce platform that enables anyone to easily set up and manage an online ecommerce store. You do not need to be a developer to do this. 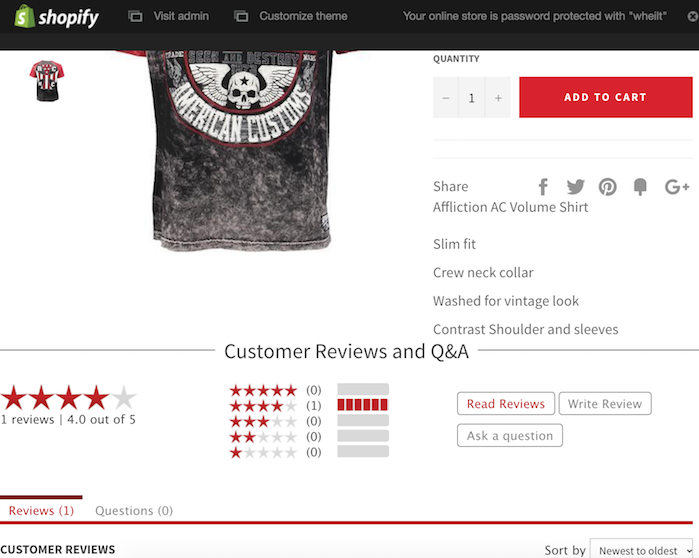 We show you how to easily add ratings and reviews to your product pages in just a couple of simple steps. You’ll need to be logged in as a Shopify admin to be able to make edits to your theme. Once logged into the store, on the left hand side click on “Online Store”, then “Themes”, then you’ll want to click on the three dots on the top right hand side (menu), and select “Edit HTML/CSS”. Locate the file "product.liquid" from the list of files presented on the left. Feel free to move this code up or down in the file in order to figure out the exact spot you'd like this to appear on your shop. We suggest placing the code below your product detail. Confirm that the Rating widget occupies the entire width of the page. Note: Make sure that you replace CompanyId and RatingboxId with your unique values for your account, which can be found on the Active Widgets page. You will now have RatingSystem running on all of your product detail page. In this week’s blog, we are focusing on one of the most powerful tools in the online marketing ordnance: the ratings and reviews. The verdict of the value of ratings and reviews on ecommerce and brand marketing websites is simple; today it’s a win-win situation for everyone. But not everyone seems to be doing it right. Whether you are a consumer or the business itself, if the customer is satisfied, the business is successful. Despite all the young, ineffective ways of marketing tools, including ratings and reviews, in past years, the ‘community’ managed to overcome these weaknesses and directed themselves into a better world of business. How did they do it? We’re here to discuss that with you. These strategies are focused on 3 main aspects of your online business – onsite conversion, customer satisfaction, and customer value. Isn’t that what each ecommerce business should be about? Generating more traffic. Taking excellent care of your current customers and value their thoughts and opinions. Always welcoming new ones with open arms. These components are essential. There are very few simple steps a business owner can follow to achieve every one of these aspects in a proper and successful manner. Step 1 - Make sure, whatever it is you are selling or providing for your customers, that every single product is integrated with ratings and reviews. Most people make this mistake today, thinking that only their most popular or most efficient product should have these structures. That’s where they’re mistaken. ‘Covering’ your market with ratings and reviews for every product, significantly can alter and boost your customer relationship and conversion. Step 2 – Think of the phrase; “The more, the better”. This is what this step is about. The more your product is being rated, reviewed and discussed, the more returning (and new) customers will buy. Let’s say you’re close to purchasing a TV online, which product are you going to trust more? The ‘7.8 out of 10 with 54 reviews’ or the ‘7.5 out of 10 with 305 reviews’? The choice is clear. The more reviews, the more relevance of the product. You must do whatever it takes to increase your review volume! Step 3 - Now that we’ve established the first 2 steps, the 3rd is quite simple and straight forward. Mentioned in previous blogs, the next step would be to leverage and extend your review content. You must put yourself out there. How can you do that? Simple. Social networking (Facebook, Twitter, etc) has proven to help businesses expand in the ecommerce world today. People talk, and people listen, especially if that person is your work colleague, your best friend, or some family across the seas. Integrating your products with ratings and reviews can boost your search rankings on Google or any major search engines’ result page. Having pre-purchase information and a post-purchase follow up e-mail can go a long way for your business! The solution is to find a review and social commerce partner who can get your review content in front of as many consumers as possible, aka Rating System! Step 4 – The last step we’d like to mention is making sure that all your reviews are trusted. Having a website full of random and negative reviews isn’t going to help your business in any way. If you think your traffic, let alone your business, if going to grow and mature that way, think again. There are lots of different manipulators out there who seek to ruin your business by posting random reviews that are nowhere near relevant to the product, or only post negative and disrespectful reviews. Even some who try and think they are smarter than the system and its people to post fake reviews. Be smart. All of these do damage to your business and to everyone selling online. They undermine trust in reviews and social commerce. The idea here to have your solutions and reviews validated by a third party (which could be your review and social commerce partner – Rating System!) that is trusted and valued by consumers in its own way. Take these few simple steps and suggestions in high consideration. 95% of all consumers sometimes or always check reviews before purchasing the product/service, and 60% of these consumers are more likely to purchase on a site that has valid and trusted reviews. What does that tell you? The power of these reviews shouldn’t be underestimated. They can either make a business, or break it. Social Commerce - People vs.
Let’s get one good proven fact here – people usually never trust advertising, definitely not as much as they would trust recommendations from friends and consumer opinions shared and posted online. Doing some research while finding reports and data, which is to be said surveying more than 30,000 Internet responders in over 50 countries, more than 90% of consumers say they would rather trust recommendations from family and friends above any other type of advertising – an increase of over 15% since about 2007. The consumers who share their reviews online rank as the 2nd most trusted source, with 70% of global consumers surveyed online stating they trust the posts on this podium, an increase of over 16% in 5 years. 3rd to 5th ranking is editorial content (60%), trusted websites (55%), and emails (45%), in the perspective range. Regular forms of advertising consisting of media such as TV, radio, and have seen a huge drop, nearly 25% since about 2009. Stating all this, it’s fair to say that friend-to-friend shared is best for business commerce. For example, you’re not going to out and buy something you are planning on paying for and the using it to find it didn’t suffice your needs. Therefore, these important elements such as ratings, reviews and customer feedback implement on people decisions and final choices. It’s very simple. People want to be told the truth, and nothing but the truth. They want their communication and interaction with you to be valued through honest general responses. They want the acknowledgement that what they have to say what matters. Finally, in social business commerce, is not just a matter of exploit some channels, or somewhat maintaining a very high level of engagement, but a service or product that’s worth sharing to other people about. If you do, so will the people. And, if all these reports and stories are accurate and factitious, then Rating System can help you boost your business commerce in certain ways, increase sales and page value through SEO integration, while your product or service is being bought or used. Social networking websites allow you to join and then share; articles, photos, blogs, pictures, websites, news and any other type of information you wish to share. Increasing your web traffic with social networking websites is one of the most important resources for getting loads amount of traffic. The major key to receive most amounts of traffic is to submit your website to all of the major social networking sites. Afterwards, place and share your webpage to many of the major social networking sites immediately. This easy process will get your website into the social face of networking faster and thus, would increase your traffic faster. The more places and the more people seeing your website will increase your traffic and the income of traffic to your site is monetized. Look at it this way. If your website is based on selling items and products, and it is believed that it can achieve a high level of satisfaction, people will share their thoughts and ideas by posting Ratings and Reviews. Now, the more you social network, the higher chance it is for your product or item “to be out there”, sort to speak. People talk. We communicate. It’s what we do. Online networking has been a huge success. So, seeing your product on a social networking page such as Twitter or Facebook, when people can’t stop talking about it and all they do it rate and write how great it is.. You are guaranteed for success towards traffic piling into your website! Imagine the possibilities, and all it takes, is a simple ‘Like’, ‘Share’, ‘Comment’, ‘Rate’, or ‘Review’. By using Rating System and social networking, you can increase your page traffic, and by increasing your traffic you have a high chance on being here; Google - Page 1.